Enter to Win $125 Cash + $175 for Charity! 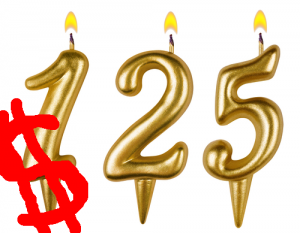 Enter to win $125 in cash and pick a charity to receive $175. Winners will get the money via Paypal. (If you don’t have an account now you can always set one up if you win!) This awesome cash prize is part of a Thanksgiving charity giveaway that I’m doing with nine other personal finance bloggers. All 10 bloggers donated $25 each to create a big ‘ol pot of cash. Out of that pot comes the $125 prize to one of our readers. The rest of the pot – $125 plus $50 donated by two additional bloggers – goes to a charity that the winner gets to choose from the list below. So a charity will receive $175 in total. Pretty cool! The giveaway runs now until November 27, 2014 at 11:59 p.m. EST. A single winner will be chosen randomly and will take home the first $125! The winner will also get to choose one of the following charities to receive the rest of the pot of $125. The charities they may pick from are Big Brothers Big Sisters, the SPCA, Tabitha, Red Cross, or World Wild Life. Nice range of choices! You can enter to win as many ways as you want! You’ll see there are more than 30 ways to enter the contest – some specifically related to BargainBabe.com and some related to the other blogs participating in this contest. COME BACK DAILY to Tweet and Enter Again!!! Giveaway ends Nov. 27, 2014 at 11:59 p.m. EST. Thank you to the other nine bloggers participating. Additional Contributors to the Charity Total! WOuld Love to win thank you for this outstanding giveaway!! !